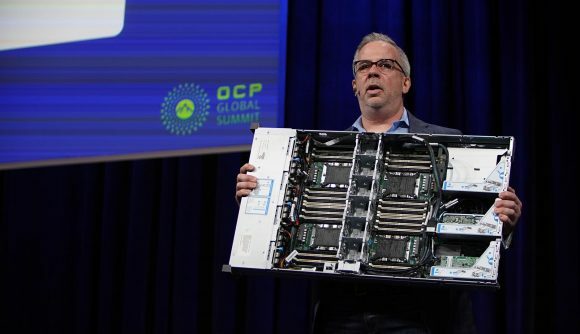 Over at the Open Compute Project Global Summit 2019 Intel’s Jason Waxman announced a collaborative effort with social media giant Facebook to develop the upcoming Cooper Lake server CPUs. Available with up to 112 cores across a four-socket design and the bfloat 16 format, these Xeon chips are built to accelerate machine learning and AI smarts. Built on the 14nm process node, Xeon ‘Cooper Lake’ server-grade processors will feature bfloat 16, a 16-bit floating point format particularly useful for deep learning implementations. This numerical format condenses a range equal to that of a 32-bit floating value with some clever bit management suited to AI education, and its particularly conducive to improving image classification, speech recognition, recommendation engines, and machine translation. Intel also has plans to roll out bfloat 16 across its entire Xeon, FPGA, and AI processor lineup. Facebook’s latest tech venture has seen it dipping its toes into the AI and machine learning silicon game with seasoned vets Intel. The social media giant’s brief is far bigger than just a place to post dog pictures nowadays, and the last twelve months have been particularly newsworthy for the tech giant following congressional grillings and the Cambridge Analytica scandal. Yikes. Is this a company we want to have access to better, more powerful artificial intelligence? I’m not so sure. But it still remains to be seen to what extent Facebook collaborated with Intel on Cooper Lake. Yet it’s GPUs, not CPUs, which have been touted as the best tech for the burgeoning artificial intelligence scene. Intel’s been working on its own discrete graphics product to tackle the data-centric workloads of today, appointing ex-Radeon boss Raja Koduri to lead the charge into the graphics card game against AMD and Nvidia. That’s all expected to come to a head in 2020 if Intel stays on track, near enough the same time Intel’s long-awaited 10nm process will start shipping en masse. It’s not entirely clear skies ahead for Intel’s Cooper Lake CPUs, however. Intel’s server market share has come under fire from AMD’s EPYC Rome server CPUs, packing more cores than ever thanks to the 7nm process node and Zen 2 chiplet design. While the red team still hasn’t managed to get anywhere close to toppling Intel’s datacenter dominance, it’s not going to be an easy ride for Intel’s latest server systems.